Drilling starch is one of the most common carbohydrates which is insoluble in the water and it has many wide usages in the drilling industry and known as the branch of starch that is manufacturing and exporting to all over the world by ATDM company. Generally starch is a subcategory of polymers and it is available in natural, natural modified and artificial types and this matter is the most important as natural polymer in drilling industry and according that this become one of our basic goods. Drilling starch as it said, has many important usages in drilling fluids and drilling mud like avoiding to waste the mud and making well structure stronger and also high absorbing. Drilling starch for controlling the viscosity of drilling mud uses in LV and HV depended on requirement and all its types are supporting by our company. One of the useful thing about this matter is lack of mixture and stability against some elements like calcium and magnesium which uses in water and oil based drilling as the primary substance. Drilling starch naturally comes from the plants by doing some process, it going to be ready for use in industries and has some adjectives like viscosity booster and antifluid loss and also is an economical filtration control and manufacturing in two parts amylose and amylopection which has complicated structure in compare to natural starch. drilling starch refers to it purity uses in wide fields like food industries or even in gas and oil drilling wells which all of them are supplying by ATDM and exporting all over the world with the best price and highest quality. 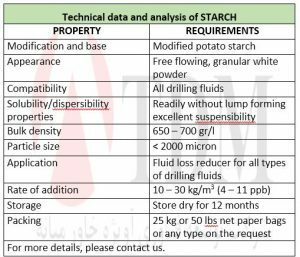 The most common starch for drilling and mining is pregelatinized starch which usually comes from corn or potato and also has a lot of other usages. Drilling starch is compatible with some minerals like KCl, NaCl, MgCl2, CaCl2 and also has no effect on PH of the fluid and has proper activity in the salty water which all of these lead to this matter become a useful element in variable industries like paper making, stickers, textiles, cooking and bakery, drilling wells and mines and lots of other fields. Drilling starch with strong standards and certifications like API 13A, OCMA, ISO or every other valuable stander which the customer required is manufacturing by ATDM company and available with different specifications like purity, viscosity, yield and some of other items refer to requirement are ready to export to universal markets. Drilling starch in every types has some same adjectives like high water absorption or temperature resistance about 250 Fahrenheit degrees and generally exist with formula C6H10O5 and according to it humidity attraction, we use moisture proof bags for our packing with variable capacities which make shipment and transferring safe and as an option privet logo printing is available on the requirement and ready to export to every spot in the world by ATDM company.